Well, I've ranted a bit about Wizard of the Coast's losing the general Magic audience and the dismal future of the game, but now I'd like to focus on a fun variant that's been around for years. I have never seen an article written on this group player variant before, and although I'm not the game's originator, I thought it would be enjoyable for Magic players to sit down with their friends and have some summer fun! Rogue is a fairly simple game. Imagine sitting down at a table with four to nine other players. Add intrigue, manipulation, and bluffing all together, and you come up with the game of Rogue. There can be only one winner in Rogue. Each man or woman is out for him or herself. I recently taught a group how to play this variant at a local comic shop and we had about two hours of fun with one game. The Players were able to pick the rules up in five minutes of explaining, and the enjoyment factor was extremely high. Even those who were knocked out of the game early enjoyed watching from the sidelines as the game unfolded. A typical game can consist of anywhere from 4 to 9 players. Before the start of the game, Players must agree to the style of play (Type I, Type II, or Extended, etc.) and a limit on card deck size. Since the game is a casual game, I would recommend that the minimum deck size be raised to 80 cards. After the group has decided on the basics, each player takes two identical cards (not of their deck) that will represent them in the game and puts one of them face down in the center of the table and the other face up in front of his/her library. Typically, Players choose to be represented by a card they enjoy playing (I normally use a Counterspell). Note that two players cannot use the same card. Since the card represents the individual Player in the game, you cannot have two people having the same card. These cards are simply markers and cannot be used in the game in any other way. Follow me so far? 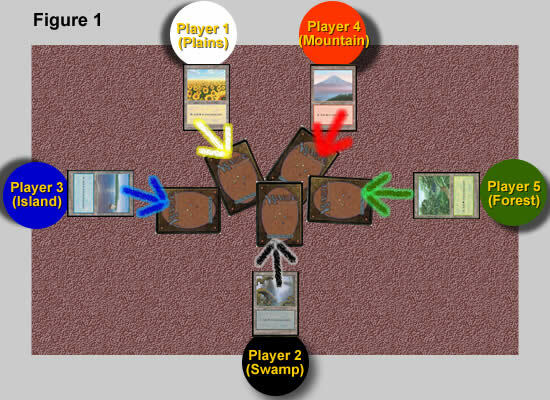 Here's the breakdown of what this means: Player 1 (Plains) can only attack Player 2 (Swamp), Player 2 (Swamp) can only attack Player 4 (Forest), Player 3 (Island) is the Rogue (who can attack anyone) because she drew her own card, Player 4 (Forest) can attack Player 5 (Mountain), and last, but surely not least, Player 5 (Mountain) can attack Player 1 (Plains). Again, at this point in the game, Players cannot reveal their cards to each other. They take their cards and hide them, face down, out of sight. After rolling dice to see who goes first, each Player draws seven cards, and then draws an eighth on the first turn. Play from here on in mostly resembles a normal Magic game. Unlike some Magic variants, Players can't share mana or block creatures attacking another Player. The tricky part of the Rogue game is to stay alive. A typical game of Rogue develops into several rounds of buildup as Players prepare their forces to attack. In all the games of Rogue that I have played, I have never seen a creatureless deck. Since you will most likely need to take out several people in the game, having creatures to do damage (or to block incoming attacks) is almost a must. Let's jump the timeline and see further into the game. After five rounds of buildup, most Players have built up a sizeable force. Several creatures are out on the table and everyone is trying to figure out who is the Rogue. There could be more than one Rogue in the game. The best games I have played consist of only one or two Rogues. Why is it good to be the Rogue? Again, this person has the ability to attack anyone on the table. In the example we used above, Player 3 is the Rogue. On her turn, she decides to attack Player 1 (Plains). She declares her attack, waits for Players to respond to her declaring an attack, and then slides, face down, the card she picked before the game started over to Player 1 (see Figure 3). Player 3 (Island) attacks with two of her creatures and Player 1 (Plains) chooses to take damage. On Player 1's next turn (see Figure 4), he is given one round of retaliation against Player 3. Thus, on his turn, Player 1 opts to attack with a Serra Angel and do 4 points of damage to Player 3. Because Player 1's attack is in retaliation, he does not need to show his card to Player 3, but if he chose to attack Player 2 (Swamp) instead, then he would need to show his face down card to Player 2. When Player 3 takes her next turn, she realizes that if she keeps attacking Player 1 that she's not going to win the game. Since she's a Rogue and knows that only another Rogue can attack her, it is in her best interest to sit back and wreck havoc with other Players. The game of Rogue is structured so that you are forced to attack only the person whose card you have (unless you're the Rogue). If you have an Incinerate or other single target player spell, you cannot cast that spell on any Player other than the person whose card you have. Thus, Player 1 (Plains) can only target Player 2 (Swamp) unless he gets a one round of retaliation from being attacked by the person who has his card (or the Rogue). Blanket spells such as Hurricane or Earthquake affect all Players. Players might agree ahead of time to restrict the number of such cards in their decks to make the game more exciting. Your group will need to decide on this. 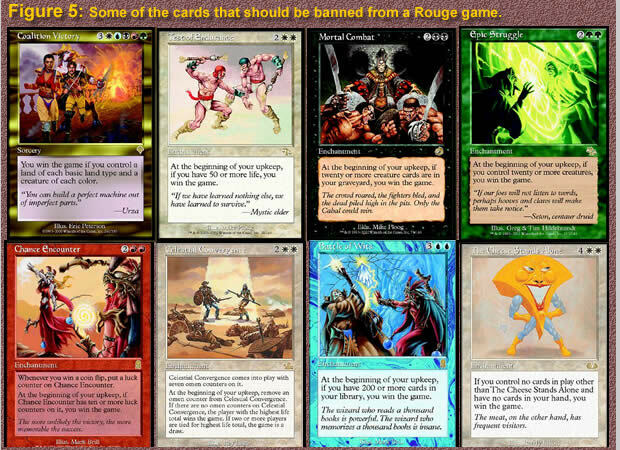 I would also suggest that all cards that offer an alternate form of winning be banned from the game (see Figure 5). To complicate matters (and thus make the game more exciting), anyone can target the permanents of all Players. Let's break that down: Each Player can destroy, steal, burn, (or even counter) any permanent in play (or coming into play). You just can't target a Player whose card you do not have (again, unless you're the Rogue). In the example we've used so far, Player 5 (Mountain) can pick a person to annoy and burn every creature he casts. Maybe he doesn't like the color of the shirt that Player 1 is wearing so he picks on him. It doesn't matter. He can burn Player 1's permanents until his heart's content. But to clarify the rules, Player 5 (Mountain) cannot target Player 2 directly with a spell unless it's a retaliation attack (or he later obtains the Swamp card). What does this do for the game? It creates chaos! Typically, one Player will start to bluff and try to restrict another opponent's progress in the game. I've attacked my opponent (whose card I had) only to have another Player cast a Fog and stop my attack. When such moves are made, a Player need wonder: Does that person have my card? Is he out to get me? Or is he the Rogue and can attack anyone? If you defeat (lower to 0 life or run out of cards) the opponent whose card you have, you gain 5 life and get to take his hidden, face down card. (If you're a Rogue, you can kill anyone you want and still gain the card and the 5 life.) After you kill your opponent and obtain her card, you're then able to attack that new person (or if you're lucky, you will have killed the person who had your card and you become a Rogue). After the game has progressed, there will be times in which a stalemate occurs. Players might have killed each other to a point in which no one else can attack. Depending on how cutthroat your group is, you can end the game and state that everyone left alive is a winner (Nah! ), or play more aggressive, and open the game to being a free-for-all. In my group, we never ended the game until there was only one person left. As in any multi-player game, the Rogue variant demands that a Player watch her resources and reserve energy for the long haul. Yes, you can come out with guns blazing and kill your opponent, but you attract the Rogue's wrath or leave yourself open to the Player who has your card. For the purpose of everyone's enjoyment, I'd also suggest that your group ban the showing of cards among Players. Players can only show whose card they have when they attack and can never show their cards in hand to another Player. If a Player has a Giant Growth and wants to use it on your creature to save it from dying, then she needs to say that openly. The strategy involved in playing the game can bring great fun back to your Magic games. Not only do you need to find out who is out to get you, but you need to play and make your own decisions in regard to who you will and will not help throughout the course of the game. Holding an Incinerate in your hand isn't going to let you win, if you could have used that card to kill the Rogue's remaining defending creature so that another Player could have killed the Rogue in a retaliation attack. On the flip side of the coin, if you're the Rogue, don't announce this fact. If you begin to attack everyone on the table, you've made a room full of enemies. Bide your time, build up your resources and pick one target to attack. Picking on the weakest Player might serve you best. Remember, you'll gain another 5 life if you knock that Player out of the game. Be ruthless, but remember not to overextend your resources. Dropping all your creatures onto the board to kill a Player and then having the next Player cast a Wrath of god will wreck you. In being successful at this game, you need to be resourceful and build a deck that's able to withstand the long haul. Playing a Sligh deck of 60 cards might help you kill one opponent, but what will you do when the Player who's out to get you plays a Wrath of god and then drops out a Protection from Red creature? It's important to build a balanced deck. More importantly, your group needs to decide upon a play style. My friends and I started playing back in the days of Unlimited. We've decided to play Type 1 with a minimum of 90 card decks. Why? If you've never tried such a large deck, give it a shot. It might seem foreign playing with so many cards at once, but there's some great fun to be had. Whatever your group decides, make certain that everyone sticks to the rules. If you would rather play T2, Sealed, or Extended, then go for it. Here's a listing of the deck I typically use. It's not the best, it's not perfect, but it's loads of fun to play. This deck of mine was originally built almost nine years ago and has evolved to the point it is at now. Take a look at the style behind it and pay particular attention to my choice of cards. Certain cards such as Counterspell, Swords to Plowshares, and Balance are a must. My finisher card is a Hurricane. Many times I've been able to pull off a Hurricane to win the game. If you don't own these types of cards in your collection, play Rogue with whatever cards you and your friends have. Once you give it a try, I think you'll enjoy it. Have fun!